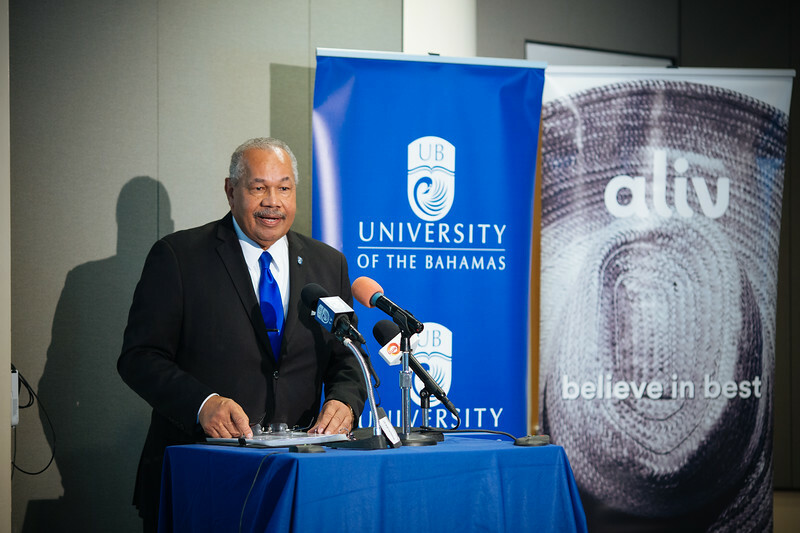 Nassau, BAHAMAS – University of The Bahamas (UB) and Aliv on Monday inked a three-year, $2.2. million agreement which will broaden the nation’s top tertiary institution’s reach in some critical areas, including athletics and online education. 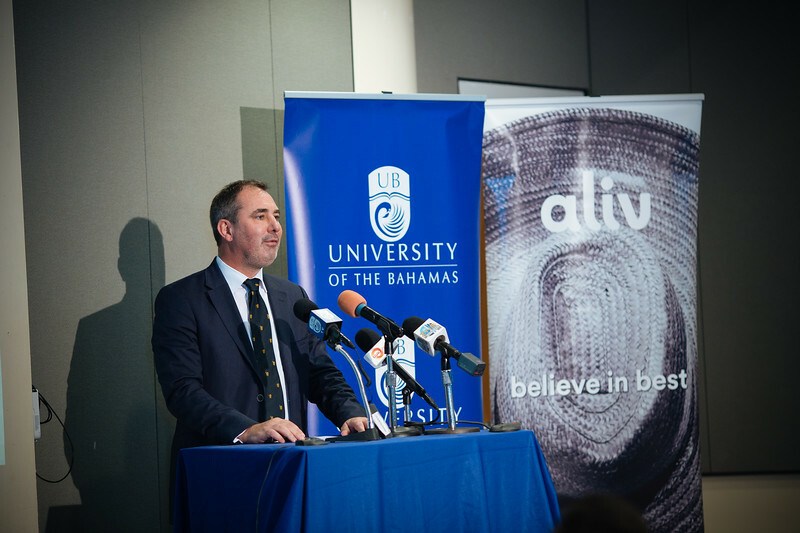 It is an agreement that UB President Dr. Rodney D. Smith said proved that Aliv does indeed “believe in the best” – in this instance, the best institution for tertiary education in The Bahamas. The agreement was signed during a ceremony held Monday at noon in the Harry C. Moore Information Centre’s auditorium, before a crowd of faculty, students, staff, UB alumni, Aliv board members and others. Even the UB Mingoes mascot was on hand to celebrate the deal, which has implications for UB Athletics, and which Athletics Director Kim Rolle said was a timely agreement for the institution and Aliv. Indeed, the UB president asserted that athletics at UB is also growing. “We will continue to provide scholarships to stellar athletes so that the Mingoes will become an athletic power-house, nationally and internationally. 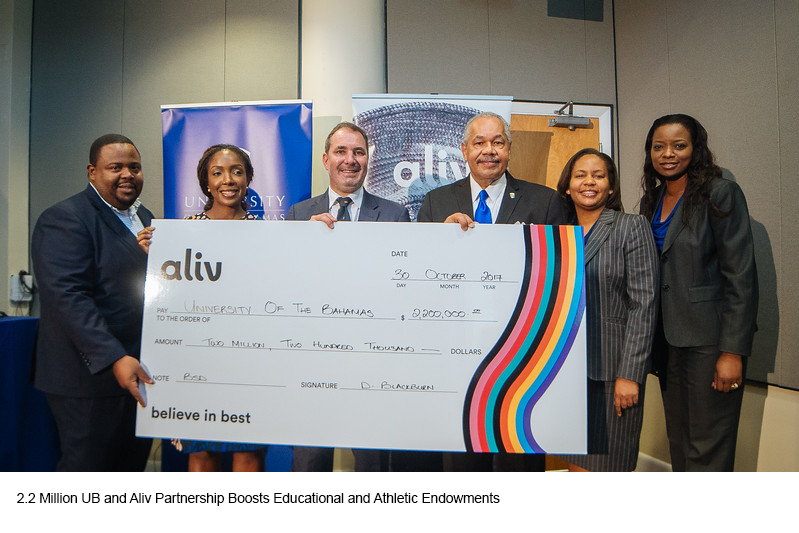 Aliv stands behind our commitment to grow both online learning and athletics – these are two of the reasons they have partnered with us,” he said, placing the partnership in its broader context. “This is indeed a welcome boost to our endowment, as the endowment allows us to give scholarships, grow academic and athletic programmes and fund some of our greatest needs, in perpetuity,” Dr. Smith explained. 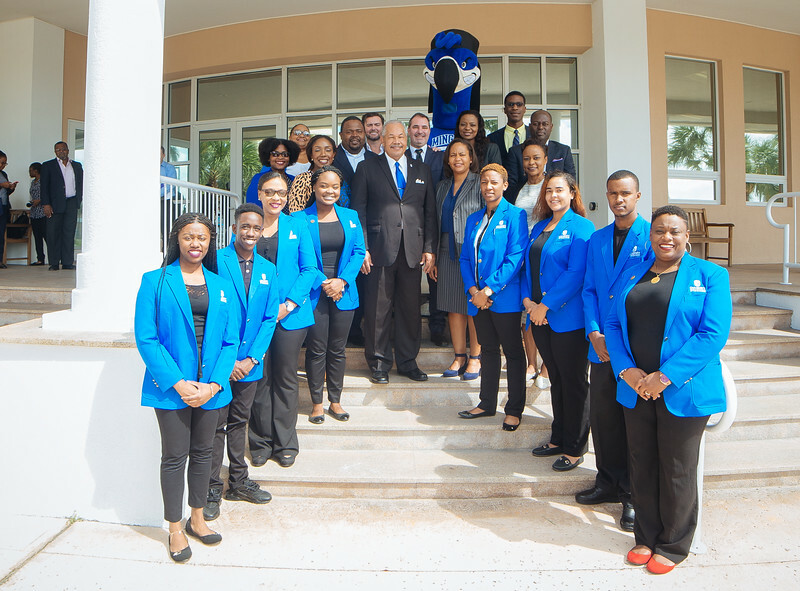 Dr. Smith added that as UB continues to grow and develop new programmes that will impact national development, the university is also feverishly working on a comprehensive programme of online learning, so that wherever one may be in The Bahamas, one can work towards a university degree. Chief Aliv Officer Damian Blackburn pointed out that UB and Aliv share nearly the same birthday: where UB received its charter on November 10, 2016, Aliv started doing business as on Aliv on November 11, 2016. “It’s only fitting that we should partner,” Blackburn said at the ceremony. 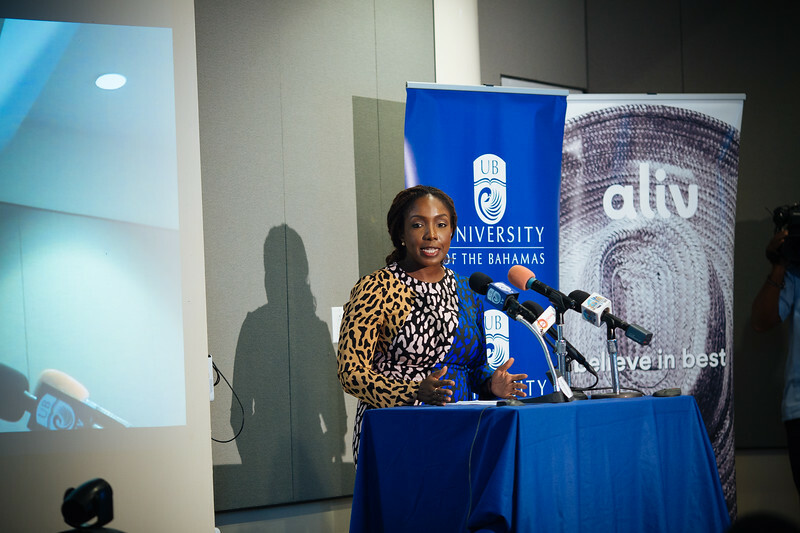 “We’re furthering that Aliv commitment to connect The Bahamas to the world. 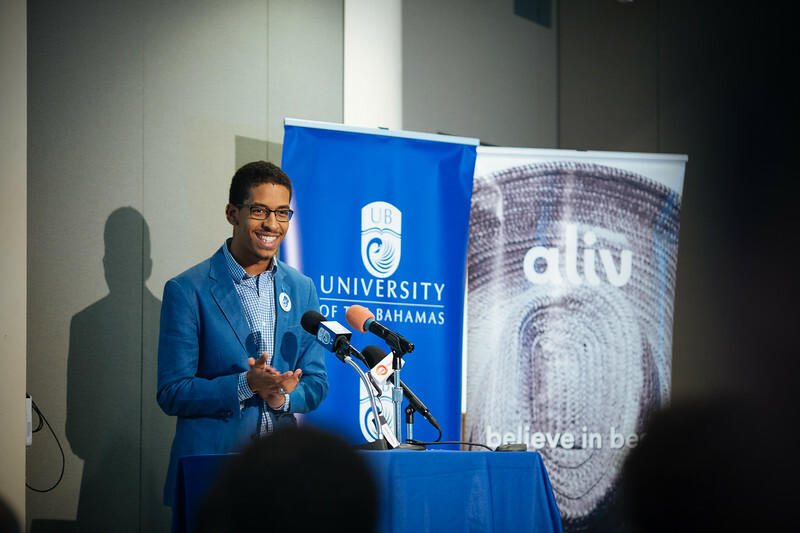 Really, I see this as a magnificent opportunity for Aliv to ensure that all the people of The Bahamas who want to pursue tertiary education will be able to do so, and I’m particularly excited about the online initiatives that the university is going to be pursuing to ensure that everybody has an equal chance in The Bahamas to gain qualifications of a tertiary academic level,” he said. Aliv has also chosen to donate $50,000 to the President’s Gala Soiree on 11th November which will be specifically given to the Student Scholarship Endowment, which will provide scholarships to first generation university students.